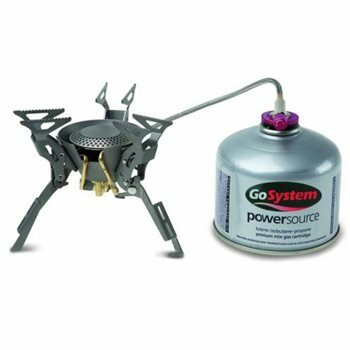 An ultra light, ultra powerful, ultra compact stove burns vapour and liquid gas via a remote GoSystem EN417 gas cartridge. This Titanium stove features precision flame control & burner protecting windshield. The linked serrated pan supports and legs fold in and along with the easily coiled braided hose create an easily packed away unit ready for transportation. Comes complete with maintenance kit and carry/storage stuff sack.